Back in the 90s, as a young teacher known for his knowledge in Maths, I developed a comprehensive Maths program based on the curriculum of the time. I personally had great success with the program, which I dubbed “Household Maths”, and with my support several teachers I worked with also followed the program enthusiastically. With little co-ordination or entrepreneurial skills, I even managed to sell a few copies of it. For various reasons I don’t ant to get into here, I was drawn away from using the program for many years, even though I still had a strong belief in its purpose and results. 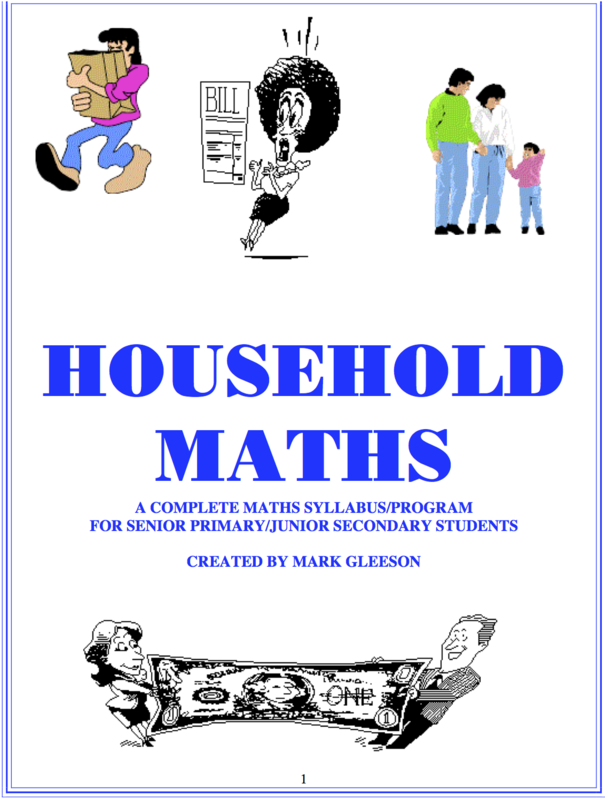 Now with a renewed push for purposeful Maths, I want to bring “Household Maths” back again. I think the basic premise of the program and the majority of its content and curriculum base is still sound, 20 years after I first created it. 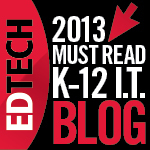 However, to get it adopted today, I’ll need to link it to current curriculum documents. Before I do that though, I’d like to throw it out there to the teaching community and gauge whether it is worth the effort. As I have said already, I really have faith in this program but I’m not going to spend months rewriting it for the 21st century curriculum if others don’t share my enthusiasm. What follows is the original introduction and program summary ( with some comments about how I would integrate new technologies, as is my want). I would really appreciate some critical feedback on what you think. Attached at the end is the PDF version of the whole program so that you can view it in its entirety. During my years involved in education, whether as a student or teacher, many teachers have made Maths such a boring subject. In turn, their classes have responded by being bored. Sheets and sheets of repetitive sums have done nothing other than keep the bright child occupied and the struggler frustrated. I have been guilty of this myself. The struggler learnt to hate Maths and the bright child just did the sums because they were easy. I have always looked for programs that made Maths interesting for the children. Many books and programs have been released under the heading of “Real Maths”. Too many, though, are just a book of activities that are not related to each other and could be dealt with in a single session ,are part of a program that still had too many worksheets filled with monotonous equations or aren’t that real to the children, anyway. Finally I’ve decided to do something myself . I thought to myself – When is Maths most useful and meaningful? The simple answer was in daily life at home. Maths is all around us in our house. Paying bills, going shopping, looking for bargains, building a house, developing the garden, planning holidays – all of these tasks are Maths at work. I wanted more than a book of activities to keep the children busy once or twice a week, though. I wanted my entire Maths program for the year to be a rewarding, interesting and entertaining learning experience based on Maths at home. Children love pretending to be adults. So this program was going to treat them like adults. The key to it all was always going to be making it interesting and fun. When faced with a policy that says Maths must be taught for one hour a day, so many teachers decide to make a worksheet of equations with as many sums as they can fit on it to keep the children working for the hour. Of course what happens is that the bright children barely have to think and finish within twenty minutes while the strugglers get stuck on the first sum for twenty minutes and just know they’ll never finish in time. This only builds up their frustration and hatred towards maths while the bright sparks just confirm what they already know – they’re good calculators. But can they think? Have they been taught to think? The Household Maths Program aims to teach the children to think about Maths, to use Maths and to realise Maths is a vital part of life. It is aimed at Upper Primary/Junior Secondary/Middle School classes because of the processes involved. If used by an enthusiastic teacher willing to be challenged by the work the children will produce, it will send out into the world students who enjoy Maths and are able to use it effectively. The teacher will have a lot of fun too. 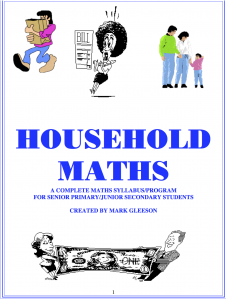 The Household Maths program is made up of two components. – Weekly activities including shopping for essentials, receiving pay, paying Bills and rent / loan instalments, petrol, Life’s Little Surprises and other weekly expenses decided upon by the “family” of the household. – Major tasks incorporating many maths skills and running concurrently with the weekly tasks. These tasks can last from 1 – 2 days to 4 – 5 weeks or more . A description of the household is given to each child. Six different households are included in this program to provide a variety of environments in the classroom. ( you can create more if you wish. ) The description covers the weekly / fortnightly pays ( or unemployment benefits ) received by spouses, the number of children in the family, house payment situation ( rent, loan or fully owned ), bank balance, credit card allowance, number of cars and something the household is saving for. The children fill in the blank lines with the names, ages and birthdays of their “children”. Each child is given an exercise book or something similar. Each page in the book is to be divided up into four columns: income, expenditure, savings and balance. The children record all transactions in this book. An example of this transaction record is provided. Provide each child with enough shopping lists to last the year out. ( master copy provided ). Each week the children will fill the list in and look through catalogues and dockets for prices to complete their weekly groceries. Get the children to plan a weekly menu to give them an idea of how much food they will need to buy their family. A record of credit card transactions is given to the children to allow them to keep a record of what they have spent on their cards. Payment ( or part payment ) will take place at the end of each month. A checklist of weekly expenses will be given to each child so that they can make sure they aren’t forgetting to do anything. Each week the children will choose at random from a collection of cards called Life’s Little Surprises. On these cards are a selection of unplanned expenses and incomes such as fines, repairs, presents, updating, competition prizes, debts etc. Draw up a chart to record when these expenses will be paid. The weekly tasks generally provide opportunities to use the four basic operations of addition,subtraction, multiplication and division and are fun and useful alternatives to pages and pages of drill worksheets. NOTE: When I originally ran this program, all of these resources involved a lot of paper use. Today, with the advent of 1:1 laptop/iPad programs, all of these components could be implemented more effectively with technology. Google Calendar, the iPad Calendar or Edmodo’s calendar could be used to deliver or remind the students of all their bills and expenses. Databases, spreadsheet programs or iPad/iPod finance apps could be used to send scheduled bills or track expenses. Excel/Numbers/Google Spreadsheets could be used to record/check the weekly cash and credit card transactions. Users of interactive Whiteboards could hide the Life’s Little Surprises cards behind a graphic and the students could drag random expenses or incomes out on the board. New skills are taught and, more importantly, used through the Major tasks or integrated activities. It is important that new skills are taught in the context of how they can be used. There is no point teaching something like percentages as just a whole lot of unrelated numbers on a blackboard or worksheet. Children, especially those with a dislike for Maths, will see no use for them. Therefore, even at the teaching stage, the skills must be related to a useful purpose. Just as important is to show how a variety of skills are needed to complete real life tasks. The integrated activities in this program involve the use of a number of skills. The age group this program is aimed at have many of these skills already so it isn’t that big a task to have the children working through these tasks. It is also easier teaching the new skills because the nature of the tasks gains and maintains the children’s full attention. Each activity is outlined in detail and the skills covered by it are included. Worksheets are occasionally included but the beauty of this program is that most of the resources are accessible to the children already and worksheets aren’t always needed. The materials required for each task are listed and most will be found in the home. Detailed lesson plans are also provided. Included is a checklist of skills that are taught through the program. You should find that everything in your school’s Grade 6 syllabus is included ( with the possible exception of some fraction work ). Use the checklist to record your students’ progress by ticking the box each time evidence of the skill being used is found. Space for comments is also provided. The general practice in schools is to allow approximately one hour a day for Maths. In doing so I would allow about 40 minutes for the main activity (10 minutes teaching and 30 minutes working on the task ) and the remainder of the time on individual household finance organisation. I would begin most days with a few minutes for the children to carry out essential transactions , such as bill or loan payments and entering their pays into their accounts. Life’s Little Surprises is an activity the children looked forward to at the start of the week to see what was going to happen to them this time so I always timetabled it for Mondays. By the time they all chose the cards it took about 5-10 minutes . If they had the money, or it was a straightforward transaction such as a speeding fine, they often completed the transaction at this time. But often it required shopping around so having LLS on Monday gave them time for this. After this brief activity , I would go straight into the main activity – the integrated tasks on the following pages. It is important not to spend too much time at the beginning teaching because the children will lose interest. Plan carefully which skills you want to focus on and what that will allow the children to complete. Remember the tasks are not one day activities so the children don’t have to be finished. Once the children are engaged in the activity, you are now free to concentrate on the children who need extra teaching. Allow about ten minutes at the end of each lesson for the children to use their checklists to see what weekly transactions they must complete. (e.g. petrol, newspaper, bill due,etc.) If they don’t have much to do, allow them to browse through catalogues to find bargains, extra items they have to buy because of Life’s Little Surprises or to start filling in their shopping list. This time may also be used by the slower children to complete work on the main activity without being seen not to have finished as much as the other children. At times, you may feel that the children are not doing enough Maths. They may spend ten minutes looking through a catalogue and complete two equations. The thinking you have to develop is : have they successfully used maths skills in this situation? Yes! And that is what is important. A child who completes 25 equations on a worksheet and the child who has bought a lounge suite, paid a bill and put her pay into an account are doing the same thing. Except the second child knows why she is doing those sums and is using Maths. This program is about quality learning not filling in the time with lots of irrelevant equations. Check out the PDF below for more detail. With greater access to websites, programs and apps, many of the tasks would be easier to complete while still requiring the same level of mathematics skill. Online shopping and auction/advertising websites, measurement and money converters, recipe sites and apps, travel websites and apps, websites for utility companies, on line maps and world time clocks….. the list goes on… provide a wealth of content to be used in real life situations. This entry was posted in Mathematics and tagged engagement, iPad, Mathematics, purpose, rea life math, student led learning by mgleeson. Bookmark the permalink. Great idea for real world applications of maths, particularly for middle school students. How long would you envisage the household budget unit to go? I am thinking that measurement would be covered by the ‘build your own house’ project. It would be wonderful if all the maths topic outcomes could be turned into a real-life project. Thanks, Viv. When I first created this program, it was with a grade 6 classroom and the weekly transaction component ran non stop for the second half of the year. The children’s comments at the end of the PDF version attached are from that class and they were engaged the whole time. some of these former students are now Facebook friends and they occasionally bring it up so it made an impact. I ran it separately from other grades as an experiment so it was able to run under my complete control. In other years when I did it with colleagues the level of engagement and length of time it lasted before petering out varied based on capacity of other teachers to fully embrace it ( it can be full on but I love pushing boundaries). Having said that, there were teachers who carried on with the program after I left the school I began it at and they still talk about it. In terms of every day useful Maths, it really does cover everything in Number ( save for fractions in some areas) Measurement, Space and Chance and Data. If I rewrite it, I will put thought into how I can integrate Pattern and Algebra and fraction operations into a real life context. I love my Maths and I think I’m up to the challenge. OMG that is wonderful. I so want to be in your class. I think the whole concept is terrific and very relevant. I can see this program not only good for lower levels but also for 5.1 students as well. I think on a daily basis why are we wasting our time and effort teaching so many different concepts to EVERY student knowing full well that most will never use things such as Indices. For weaker students all it does is crush their self esteem and then we wonder why they hate maths. I agree with your philosophy completely. Thanks for the enthusiastic response. I’ve always believed there should be a practical Math running alongside the general Maths curriculum. 95% of the population have no need for surds, quadratic functions or how to find the area of an icosahedron but everyone should know how not to go broke, book a holiday, understand interest and discounts and design a backyard. One day, we will have a system that supports life skills instead of university preparation. Students don’t hate Maths, they hate the curriculum we force them to suffer through. Mr. Gleeson, This is awesome. Your ideas can certainly be used today, especially with the implementation of the Common Core Standards here in the U.S. For the upper grades, income, income taxes and budgeting can also be incorporated. I subscribed to your feed. I love it! I’m trying to figure out how to better integrate entreprenueurialism into math myself. I toyed around with the idea of having my students run a business and document all the math required. If you have any ideas, I’d love to hear them. Have been toying with that idea myself. I think it would fit into my program nicely if I rewrite it. Having kids experimenting with profit margins based on income and expenditure, sale discounts, price mark ups, the cost of advertising and promoting , buying or renting office space, investigating eBay, setting up a website and the costs of setting it up, marketing and researching through surveys, using finance apps to look at banking, borrowing costs and interest rates,…..and on we go. It would be great if local businesses and councils could get involved with classes and share the real life issues with them. imagine how practical high school work experience programs could be if this was the focus. Yes! It would be definitely worth it!! This is incredible – you have an absolute gem just waiting to be updated! I love this – love the idea, love your philosophy and love the experience children would get from participating in something like this. I have been looking for something exactly like this, mainly to promote financial literacy, but there are really so many other aspects to household mathematics that you address here. Look at the current economic state of the world …. kids need REAL practice on these kinds of things. I love your ideas and really look forward to seeing more about this. Awesome! I like the idea a lot. I work with adults who struggle with math. One huge problem is that so many of them have learned math as a set of procedures; changing the curriculum won’t necessarily change that. I can’t help but think that if younger students were learning practical applications of maths, they’d be more likely to connect to the concepts, though.